Are you looking for fast paced competitive fun for all the family, over the School Summer holidays in Glasgow? Lazer Planet at Scotkart in Clydebank offers you ‘Fortnite’ style laser tag like you have never seen before, using hi-tech equipment, and huge immersive arenas complete with ramps, towers, tunnels, and smoke. Each amazing 30 minute session includes 3 different solo or team missions, with different objectives. Unlike paintball there is no costly ammo to buy, and in most games you get unlimited respawns. The deal can be booked 7 days a week 12Noon – 8pm only at Lazer Planet, Glasgow’s ultimate sci-fi laser tag experience. You can find ScotKart Indoor Kart Racing and Lazer Planet just off Dumbarton Rd, only a few minutes drive from Glasgow City Centre, and Glasgow West End along the Expressway, or via the Great Western Road. It’s also located close to Yoker train station, and many bus routes stop on Dumbarton Rd. Visit TRAVELINE for more details. Suitable for ages 6 – Adult. 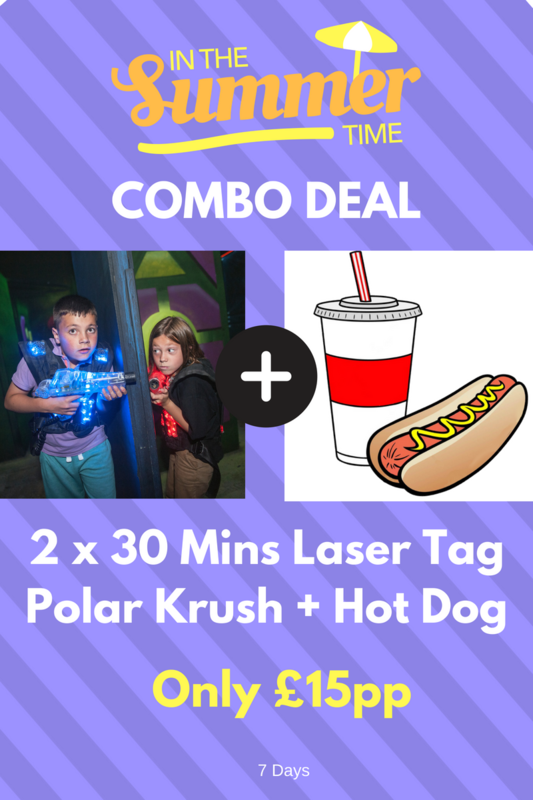 Book now on 0141 641 0222 quoting Lazer Planet Combo Deal, or BOOK ONLINE now. T&C Offer subject to availability and cannot be combined with any other offer. A soda can may be substituted for the slush drink. Valid until August 20th 2018.